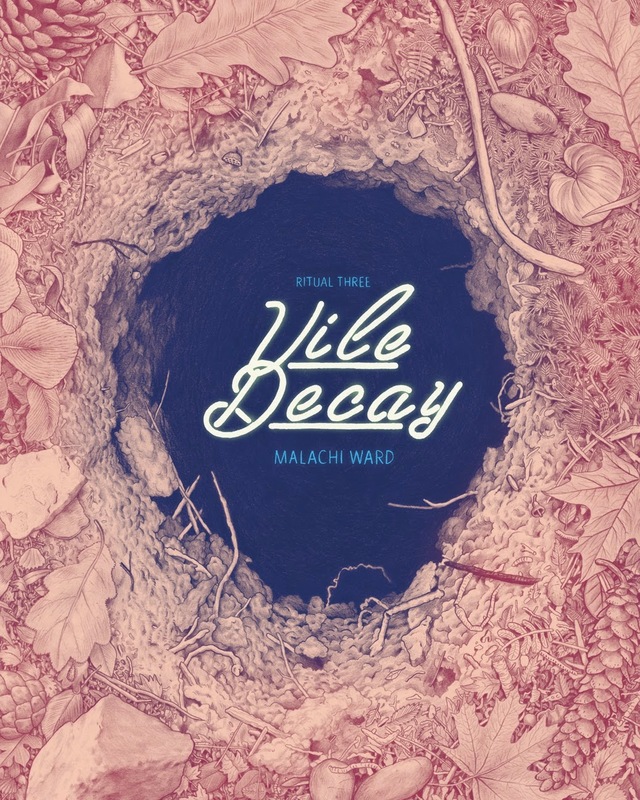 I'm not quite sure what to make of Malachi Ward's Vile Decay. I know it was compellingly beautiful enough -from cover to interior- that having read a pdf version, I ordered and bought a print copy (it's a very nice thing to have: a grainy cardboard cover, thick cream paper stock, in a reassuring, boxy 8 by 10 inches format). I know that while I don't fully comprehend it, it is meaty and of enough interest to have made me re-read it a few times now, and that those re-reading's have not diminished the strength of what it offers. Pink and purple squares pixelate, gather, and clear, to form a rocky landscape upon which an old woman and a young boy traverse. The old woman's hair blows in the wind, her tattooed face severe as she talks to her young grandson about days past- Ward plays on the motif of the dramatic poignant moment where the more experienced character imparts emphatic, emotionally resonant advice to her younger counterpart 'Listen up, boy. I'm about to tell you a goddamn story.' It's skewed here due to the grandson appearing to be about 10 years old. And then thrust aside completely as the images dissolve and dissipate; a simulated computer program, leaving the old woman and her grandson as another story is started up- what seems to be flashback to the woman's youth; a political demonstration of some kind. Vile Decay undergoes a few of these creations and crumblings, where Ward presents scenes, a tale, characters, only to move on and away from it, leaving the reader to ponder over the reality of each layer and its relevance. The woman and the future-scape, sci-fi setting seem to be the established factors, but all else is up for grabs. It's a matryoshka of narratives, of stories passed and yet to come, real and imagined, a lightly poetic treatise on the shifting nature of memories, shaping and shaped, our ever untenable grasp on them, and symbiotic relationship we have with the mind. I read Si Spurrier and Jeff Stokley's superb Six-Gun Gorilla last week, and that was a lovingly crafted paen to stories, their power, the tradition of narration, of recognising ourselves in something else. Vile Decay is a variation on that theme; the old woman recounting her stories- at one point remembering her younger self out at night with a group of friends, siting under a bridge, sharing drinks and taking turns to tell stories. Definitely the most striking part of Vile Decay is Ward's art, in particular his envisaging and depiction of environment and structures and the choice of colours he employs to do so- the tones of purple and red are uneasy psychologically, but work to provide a sci-fi landscape that never settles and looks freshly strange; slightly ominous. The vast (inhabited) structures have a shape and appearance that indicates a fibrous origin, yet their weight, size, smooth texture, and sheen lend them an incongruous stoney quality, reinforced by their formation pattern and the manner in which they rise, monolith-like. The natural references and sci-fi tones blend together to again show us something familiar and yet not so, pulling on memories of the known and the gaps of the future. Ward has gone to town with the art in the whole of this book (the crowd protests scenes come to mind), but these few panels are something else- sublime in the simplicity of their rendering. A really impressive book.